Hiking Rocky Mountain National Park: Number 200- "Dundicking" via Cow Creek TH. Number 200- "Dundicking" via Cow Creek TH. 11//3/14- Please note the RMNP trail crews have been hard at work over the summer, and the bridges I'd described as missing have now been repaired. The trails are in much better shape as well! No better place to be! With a view like this I already had a good feeling about the day ahead. To get to this trail head, take a right on MacGregor Avenue off of 34 (immediately past the Stanley). Continue on as this becomes Devils Gulch Road. After a few miles, bear left onto McGraw Ranch Road. Continue on this until you come to McGraw Ranch on your left. The parking area is indicated by signs on the left side of the road. I imagine it is a bit busier in the summer since the trail to Bridal Veil Falls starts from here. Follow the signs to get on the North Boundary Trail. The flood has damaged the trail somewhat, deeply rutting parts of it up until the top. However, it is easy to follow and navigate. Once you gain the saddle, there is about 600 feet of loss down to West Creek. There is one section of this part of the trail that was damaged quite heavily, in fact now has a bit of water flowing down it. Looking up at that section. The bridge over the creek is gone. There were a few rocks in place that afforded me a relatively okay crossing. I added a few more on the way back to hopefully help ease the way for anyone else. The trail is damaged up to gone in some places on the other side where it runs close to the creek. You'll gain some altitude before loosing some altitude. Soon you will come to the long lost Husted Trail. I'd posted about it previously, and it was reading Chris Roberts' blog that led me to do some research on this trail and find it a viable option to ascend up into the West Creek Research Area. You'll cross a small possible seasonally wet drainage, and then look for this large, flat boulder on the west side of the trail. There is a cairn on top of it. Head west here and you'll be able to find the Husted Trail. I am not sure when it was last maintained- next time I am in the park I will see if I can find out. I know it appears on the 1961 version of the USGS map, but not the 1987 version of the same. 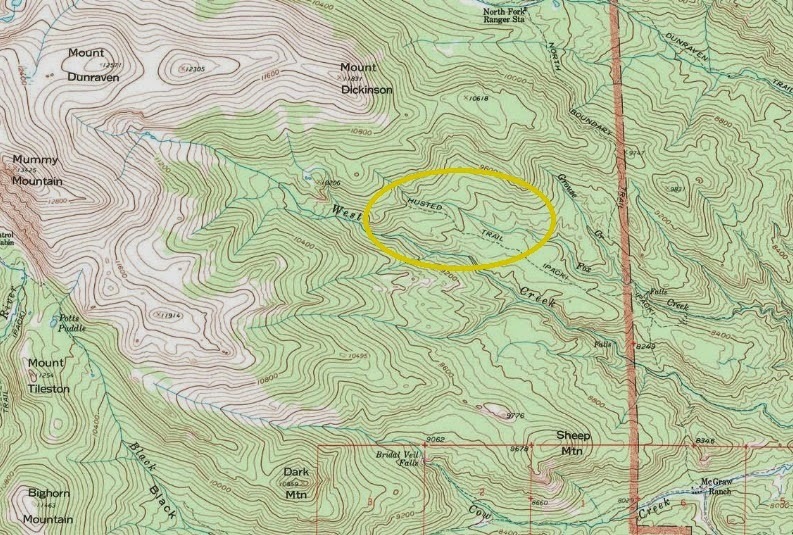 Here is a screen capture of the 1961 map and you can clearly see the trail. Of course it can now be a little difficult to find at times. But I must say that for the few miles you are on it and the 1000 feet or so of gain it will bring you, it is a pretty awesome trail. Very pleasant hiking and beautiful scenery. Such as this! Mount Dickinson will come into view pretty early on, and just as when approached from the Dunraven TH, it looks very, very far away. Eventually the trail will enter the West Creek fire area and become less distinct. There are some cairns that will show you the general way, but you just need to continue west towards the high point that is directly in front of you. All that's left of one of the victims of the fire. Looking to the south as altitude is gained. This is the slope you'll head up and contour north around before heading directly up the south side of Dickinson. Tree graveyard. From here, the rocky points on top of the ridge line beacon you forward. They are neat to visit, but the true high point lies to their west, so aim to the left of them if you want to head more directly to the summit. I'd seen some intermittent snow as I gained altitude on the way up, but with no needles on any of the trees to provide shade, the vast majority had melted and it wasn't bad at all. I'd cursed carrying along snow shoes the whole time. But now I was glad to have them, as postholing was frequent and deep. because the stumbling that ensues makes me feel like the village drunkard in an early Irish novel. I crouched atop Mount Dickinson for the second time, and found the summit register wet. Ah well. I was on top of it at one hour before my hard turn around time, and I was well ahead of the pace I'd set in January. Amazing what less snow will do for you. Onwards! With the wind coming from the south, I found some solace on the northern side of the ridge. More snow, though it was hard pack here and was able to support my weight. Interestingly enough, I did notice some boot prints here from one or more individuals who are as demented as I am. If you happen to read this, we should meet up for a hike sometime. Beautiful wispy clouds, wind roaring. And then I was there. I wasn't going to pass it by this time! The high point is on the left. It looked like there had been a glass jar acting as a register, but it was broken and no paper was to be found. And west to Dunraven and other peaks in the Mummy Range. North to Sugarloaf Mountain and Stormy Peaks. It was a great feeling to carefully sit on top of my 200th named destination in the park! I shot a short video but it ended up being so windy you can't hear what I'm saying so that will remain in the vault. But I did just want to give a thanks to you for reading, to my wife for her support (and sorry for the undue worry all these long days give you), to my friend and often companion Dan for his company, and to my family and friends for being awesome. I started to loose elevation almost immediately, for I saw no reason to stay high. I aimed for the top of the slope you climb when the Husted Trail ends. A brief lull in wind and a different view of Mummy Mountain. I located my snowshoe tracks and followed them back to the cairned trail. I found myself wandering at times until it got back to the trees and became easier to follow once again. Pretty good hiking on the way down as well. I ran out of water somewhere around here and decided to fill my Camelback with snow. Though less than ideal, this melted enough to get me back to the car. As this never seems to happen, the trail goes right by the small seasonal drainage that you cross on the North Boundary trail, and you can see precisely where it starts. Here is the small trickle that comes from nowhere to form that little creek. Back at the North Boundary Trail, there was just one final obstacle to conquer: the final 600 feet of gain between West Creek and the trail head. Last time this really killed me. I hadn't eaten enough during the day and was bonking super hard. This time I made sure to eat well throughout the day. While it still wasn't fun, I made it up much easier and quicker than last time. I got back to the car eleven and a half hours after I'd started. What a day! This was a pretty difficult day, but certainly right up my alley. I love the minor peaks of the park. I love being off the beaten path. Hiking the Husted Trail was one of those small pleasures in life- I hope to make a return to it at some point this year. From start to finish, I didn't see a single person. It was a good and much needed day of mental recharge. Here is a link to a map I made on Caltopo. While an estimate, this is probably pretty close to the reality. Though you only end up at 12312, this hike gains more elevation than Longs Peak, and more than the highest gain standard route in the park- Chiefs Head Peak at 5239 feet from Sandbeach Lake. In fact, I think my previous outing to this ridge from Dunraven TH was my highest gain day ever, at just under 5700 feet. If you want a day of solitude and desire to hit some of the minor peaks in the park, add this one to your list for the summer. 15.3 miles round trip, 5785 feet gross elevation gain. Second class. Strenuous. The trail and bridges have been fixed thanks to the RMNP trail crew. You are correct. I have been that way since, but just hadn't gone back and updated this post. I will do so now. Beaver Mountain via Beaver Meadows TH. Cleaning up the East Side.